The idea underlying the framework, as laid out by Plastrik and Taylor, is that network value is diverse and depends upon its particular type or modality. At the level of connectivity, we see gains made through trust and relationship building, the rewiring of connections in the system, information sharing and developing new knowledge. 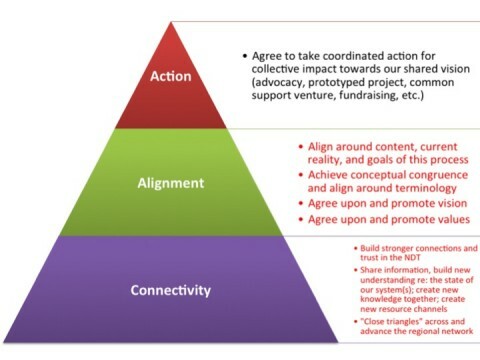 At the level of alignment, value is gained through intentional development of shared value propositions in the form of mutual goals, shared vision and values, and overall ideological and conceptual congruence, whether or not people formally coordinate action. And then action is about just that, joint and coordinated effort towards a clear and tangible outcome. Great post, Curtis. It seems to me that if we get to know one another outside of our organizational realms and in a variety of contexts, we can reduce the risk of being hemmed in by organizational affiliation. We can also reduce the likelihood of limiting network effectiveness by making sure there are opportunities to get to know more than one representative from each organization. One technique that works is “bring a colleague to the network” events that are part work/part social time – modeled on the “Bring our daughters and sons to work” days. This is especially effective if the colleagues who attend have a role in the organization that could benefit directly from the network’s work in obvious ways. I like your idea of “bring a colleague to the network”! Makes a lot of sense. And I am so appreciative of how fundamentally you model the network ethic in what you do and who you are. This is a great post! A network is only as strong as its ability to connect ties and hold its space. Connectivity to me is the foundation of network building and structural transformation.